If you want to experience some of Tennessee’s dark history, the Dark Side of Memphis Tour is highly recommended. The tour guides are knowledgeable and enthusiastic about the subject matter, which revolves around criminals, prostitutes, murders, voodoo, and paranormal activity so it is just the perfect thing to do in October. With Halloween just around the corner, it is a great idea to get a group of friends together and learn about some of the more sordid details of Memphis history to get into the spirit of the holiday. The tour lasts one hour. On the tour, you will see some of the sites of paranormal and ghostly activities around Memphis. 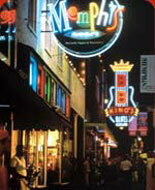 The guides will take you for a walk down Beale Street and see some of the spookiest haunted locations in town. One stop on the tour is the Gayoso House, a house where a violent murder occurred. Howard’s Row, another tour stop, is the site of a former slave market and hospital used during the Civil War. A serial killer walked the streets of Memphis in the 1970s, and the tour guides will tell you all about it. There is a walk down Barboro Alley, known for the dark role it played during the epidemic of yellow fever. Other sites on the tour are the Orpheum Theater and Cotton Row. The Dark Side of Memphis is a tour offered to adults and children, though much of the content of the tour is disturbing and geared more for adults. Remember to wear comfortable shoes and warm clothes for the fall weather! The tour is completely outdoors. Though there is an hour’s worth of walking, the pace is leisurely. Tickets can be purchased online at https://www.trustedtours.com/store/dark-side-of-memphis-tour.aspx. There is a discounted ticket for children ages 7 to 12.